It is hard to find a better place to duck hunt on the Texas Coast than Rockport! 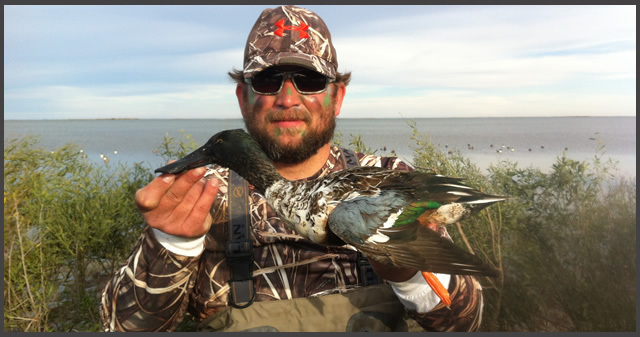 Ducks such as, Green-wing and Blue-wing Teal, Redheads, Pintails, Widgeon, Spoonbills, Gadwalls, Buffleheads, and Bluebills are common species that can fill your bag limit! Guided and unguided hunting trips are available in both mornings and afternoons. Trips depart from either Goose Island (just north of Copano Causeway) or Cove Harbor (south of Rockport). Both are a short distance from Rockport, Texas and the Captain will fill-you-in on your trips details when you call to reserve! For Larger Groups - Multiple Boats are Available to Take you to the Blinds. We Can Accommodate Your Needs! He will transport you to the blind(s), spread the decoys, clean and bag the ducks for your trip home! **REQUIRED: Federal Migratory Bird Hunting & Conservation Stamp Plus your Endorsement Receipt. A person 17 years of age or older must possess a migratory game bird stamp endorsement receipt to hunt any migratory game bird in this state. Federal law also requires waterfowl hunters 16 years of age and over to have a Federal Migratory Bird Hunting and Conservation Stamp (commonly called a Duck Stamp; available at most post offices and TPWD offices). VISIT THE FOLLOWING COMPANIES THAT MAKE DUCK HUNTING GREAT! *ALL PARTIES ARE RESPONSIBLE FOR THEIR OWN GUNS AND SHELLS - AT ALL TIMES DURING THE HUNT. *SAVE YOUR ALCOHOL/BEER FOR AFTER THE HUNT PLEASE. THIS IS PART OF A SAFETY PRECAUTION FOR HANDLING FIREARMS.